Our dear friend Ben Morton is headed to Chicago for the weekend to run his first half marathon (goooo Ben!) and he’s bravely decided to entrust his transportation to Megabus, the express bus service that touts fares as low as $1. Because Megabus is relatively new to the Nashville area, we thought a lot of people might be interested in hearing how Ben’s trip goes. So here are the facts: Ben purchased his ticket back in mid-March for $18.50, taxes included ($13 to Chicago, $5 back to Nashville). His bus departs at noon today and is expected to arrive in Chicago around 9:15pm. 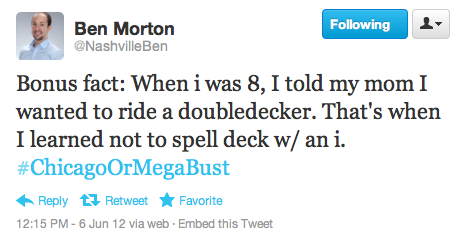 Follow along below or by tracking the Twitter hashtag #ChicagoOrMegaBust (or just follow Ben, he is great).